One of the easier meals to make on the Paleo diet is soup. It basically involves adding all of the ingredients into a pot, cooking them up until they are tender, and serving it up. What makes these Paleo soups so special is that they only contain ingredients that are approved according to the Paleo guidelines. 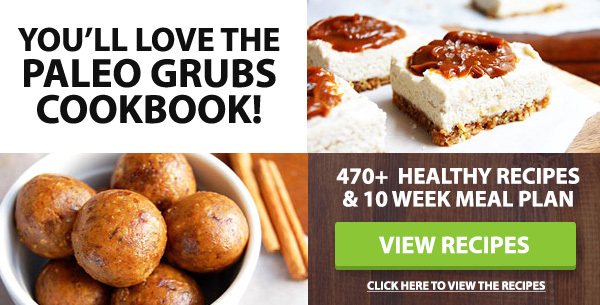 They take great pains to exclude the ingredients that are typically found in soup that will set you back on your dieting efforts, including grain and dairy. 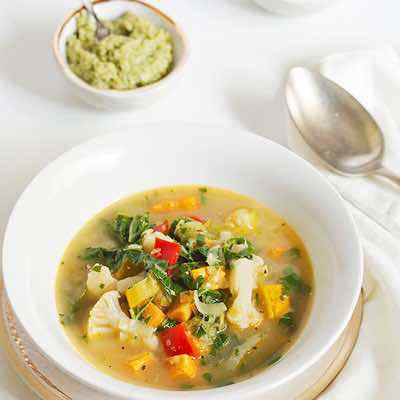 Cauliflower provides a delicious base for this chowder recipe. This paleo soup is also much healthier than typical chowders since it is dairy-free and low in carbohydrates. 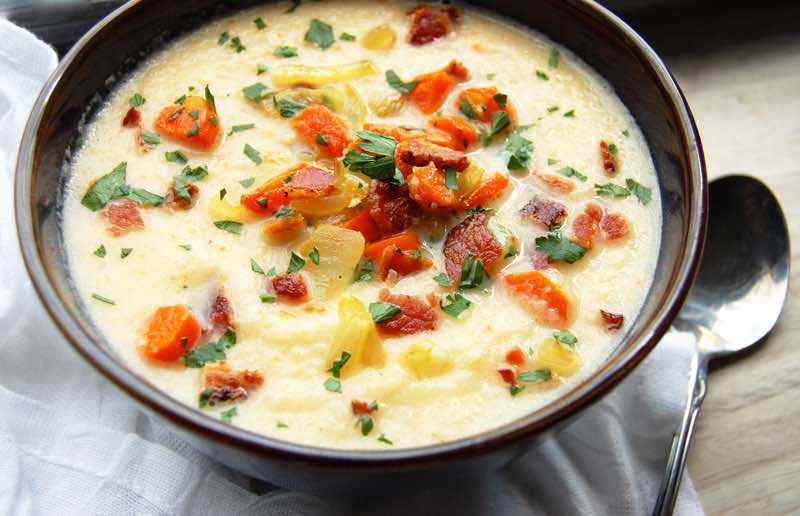 Creamy and hearty, a bowl of cauliflower chowder is perfect to cozy up with on chilly nights. 1. Heat the olive oil in a large pot or Dutch oven over medium heat. Add the onion, carrots, and garlic and sauté for 5 minutes. Add the cauliflower florets and sauté for 2-3 minutes more. Add the bay leaf, and then gradually stir in the almond milk and chicken broth. Bring to a boil, then reduce the heat and simmer for 12-15 minutes or until the cauliflower are completely tender. 2. Meanwhile, cook the bacon on the stove until crispy. Remove to a paper towel-lined plate and crumble. 3. Use an immersion blender or food processor to combine the cauliflower mixture until smooth. Season to taste with salt and pepper. If the chowder is too thick, add more chicken broth until it reaches the desired consistency. 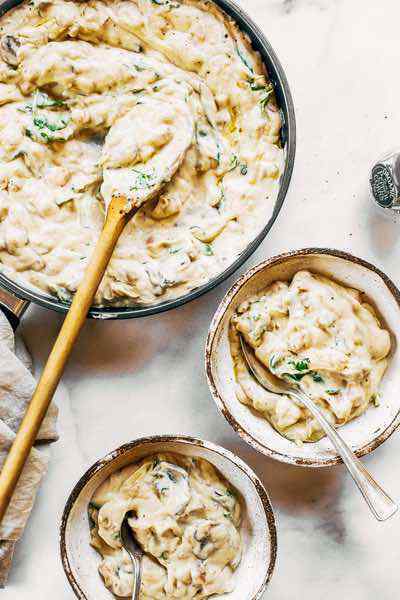 Serve immediately, garnished with crumbled bacon and parsley. Simple ingredients come together to make a delicious and heart-warming soup that is perfect for the cold season. Ginger adds a tangy freshness to the soup but isn’t overpowering. This recipe is a great way to use up extra carrots, and also tastes just as flavorful when enjoyed as leftovers the next day. 1. Preheat the oven to 400 degrees F. Place the carrots and onion onto a baking sheet and drizzle with 1 tablespoon olive oil. Sprinkle generously with salt and pepper and stir to coat. Roast for 20-25 minutes until the carrots are tender. 2. Heat the remaining tablespoon of olive oil in a large pot and add in the garlic. Sauté for one minute, then add the chicken stock, ginger, and thyme. Bring to a boil, then reduce heat to a simmer and cook for 10 minutes, until the carrots are finished in the oven. 3. Add the carrots and onion to the broth and simmer for an additional 10 minutes. Remove the ginger and thyme from the broth. Using an immersion blender, puree the ingredients in the pot until smooth. (Alternatively, carefully transfer to a blender.) Season to taste with salt and pepper and serve warm. 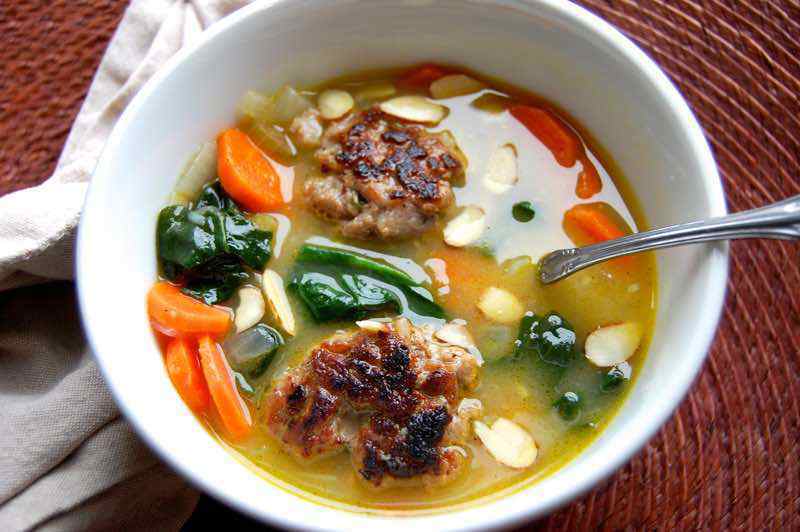 This Paleo Italian wedding soup omits the pasta for a healthier, low carb version that is still every bit as comforting and hearty. 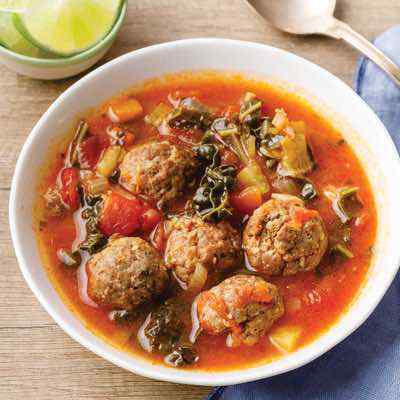 Use meatballs from the freezer that have been previously cooked in order to shorten the preparation time for the soup. For the green element of the dish, you could use spinach as suggested, or substitute chard, kale, or even collard greens. 1. Heat one tablespoon of olive oil in a skillet over medium heat. Add the meatballs and brown on each side, about 5 minutes. Remove from heat and set aside on a paper towel-lined plate. 2. Heat the remaining olive oil in a large, deep saucepan over medium-high heat. Add the onion, carrots, celery, and garlic. Sprinkle with red pepper flakes, salt, and pepper. Sauté for 6-8 minutes until soft. 3. Add the white wine vinegar to the pan and stir. Add in the chicken stock and bring to a simmer. Simmer for 5 minutes, and then add the meatballs and spinach. Simmer for an additional 5-7 minutes until the meatballs are heated through. Adjust salt and pepper to taste. Serve warm garnished with sliced almonds. Let the slow cooker do all of the work in preparing this meal that is great for a weeknight dinner or for feeding a crowd. This is a recipe that can be made with either chicken or pork. Serve the spicy, flavorful chili verde with fresh lime wedges and cilantro to finish off the dish. 1. Add the chicken broth, olive oil, and spices to the slow cooker and stir. Season the chicken with salt and pepper and add to the slow cooker. Add in the remaining ingredients, cover, and cook on low heat for 6-8 hours. Season to taste with salt and pepper. This soup sounds like its something from a gourmet five star restaurant, and is proof that you can eat well while you are on the Paleo diet and aren’t subjected to food that looks like typical diet food. 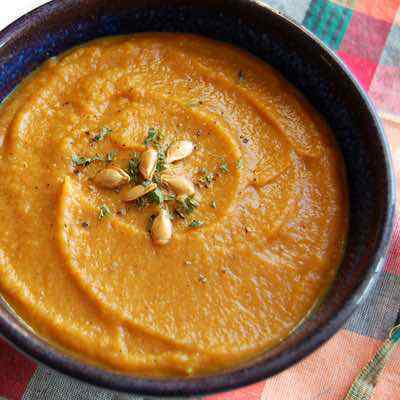 The main ingredient for this recipe is butternut squash, to which they’ve added a medley of spices such as cinnamon, nutmeg, cumin, cardamom, and more. They do use grass fed butter here, which many Paleo followers will allow but you can replace if you want to avoid dairy altogether. Coconut milk gives it a nice creamy texture and added flavor. 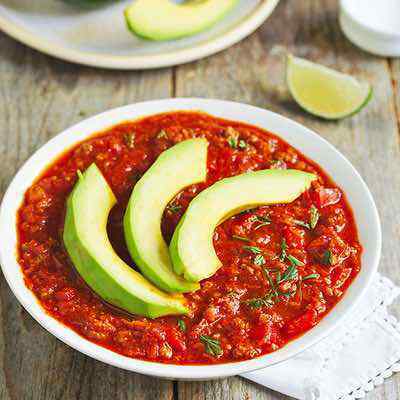 Pizza is back on the menu with this Paleo Pizza Soup that captures everything you love about a pizza and lets you eat it with a spoon. The toppings of the day are pepperoni and sausage, and of course there is plenty of tomato sauce, garlic, and seasonings to get the flavor just right. 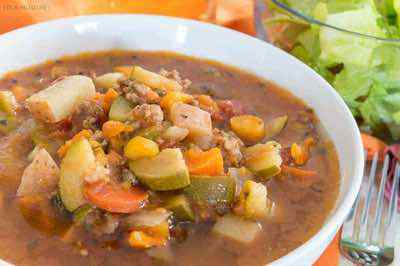 You won’t miss the crust while you dine on this soup, as there are other supplemental ingredients like black olives and bell peppers. As a bonus she shows you three more ways you can modify pizza to make it more Paleo friendly. 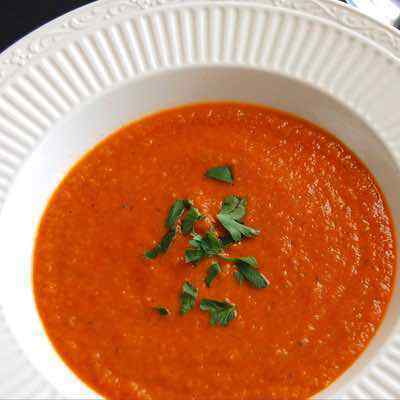 Tomato soup is one of the more classic soups you can make, and many consider it comfort food. 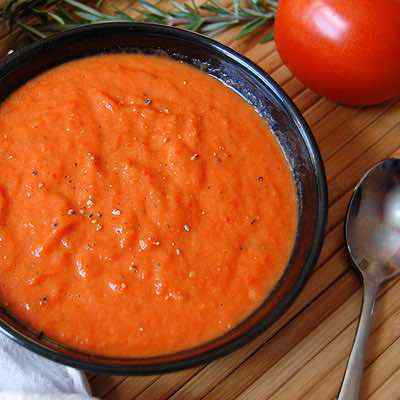 The only problem is that traditional tomato soup is not only made with conventional tomatoes, it usually involves using milk, cream or some other form of dairy to give it its taste and texture. This tomato basil soup uses the time tested pairing of tomatoes and basil, but leaves out any ingredient that will cause you to have stomach upset later, or cause you to gain weight. Paleo eating is clean eating, and in this recipe they are keeping it simple with some coconut milk and grass fed butter to get the job done. 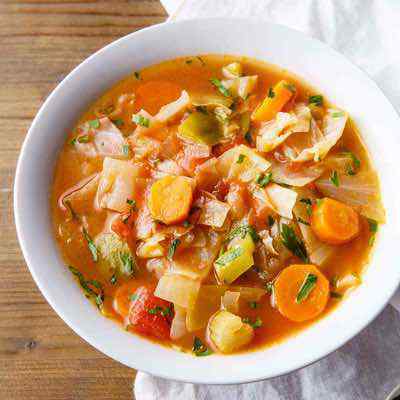 Here’s some chicken soup for your Paleo soul, a chicken vegetable soup you can enjoy without worrying that it is taking you off of your diet plan. It includes delicious yet healthy things like coconut oil, onions, carrots, squash, mushrooms, and plenty of shredded chicken. They are giving your taste buds a thrill with spices like thyme, rosemary, and cumin. This is one chicken soup that doesn’t come from a can, and doesn’t take long to get everything into the pot. Proof that you don’t need noodles in your chicken soup to be happy. Saffron might not be a spice that you typically use, but when you start eating Paleo it is a good idea to experiment with different spices are out there so that you always have a flavorful dish at the ready. In this instance they are using cauliflower as the vegetable for the base of the soup and they’ve added to it several ingredients to make it even more healthy. Cauliflower is a cruciferous vegetable that has many health benefits, and is one you often see used in plenty of Paleo recipes due to its versatility. Don’t let the title fool you, this isn’t the sort of soup that your grandmother probably made. It is not using traditional spaghetti, and in fact isn’t using any spaghetti at all. There’s two types of meat, both sausage and beef so this will be a savory soup sure to satisfy your appetite for hours. Joining the meat is plenty of vegetables, which is the hallmark of a properly balanced Paleo meal. 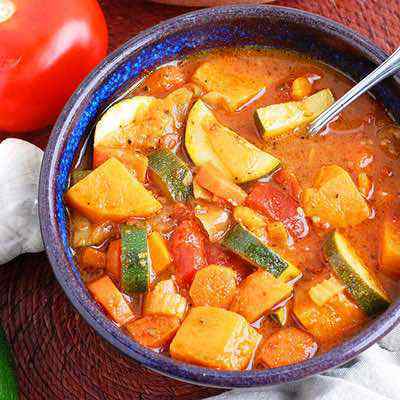 These veggies include zucchini, celery, green pepper, and onion, and are joined by seasonings like oregano, garlic, and a blend of Italian herbs. Paleo is great because you can sample many tastes and flavors from around the world as long as they conform to the Paleo food guidelines. 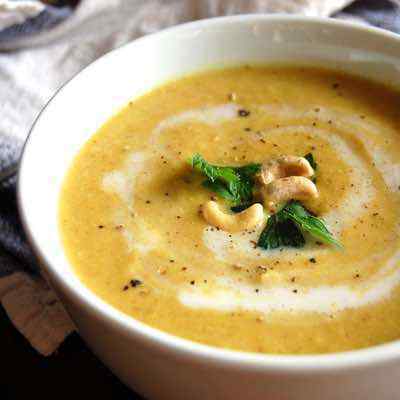 In this Gobi Masala soup they are taking the spicy cauliflower curry recipe that is popular in India and making sure that it’s Paleo friendly. The base is made up of cauliflower, but it’s not a one-dimensional offering here, as it also contains carrots, onions, and a list of spices to get the flavor just right. These include cumin, coriander, and turmeric, for that distinct flavor you just don’t get from other cuisine. 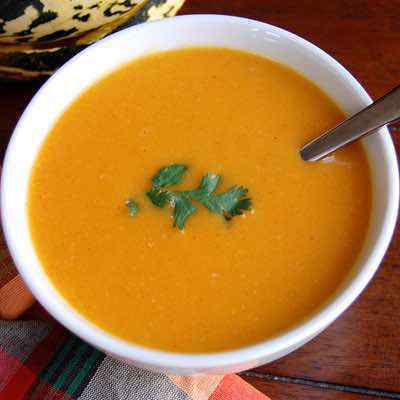 Here is a recipe that takes an assortment of root vegetables and makes a tasty soup out of them. You can tell they are trying to keep this Paleo because they are recommending that you use organic versions of the ingredients whenever possible. Paleo is about getting choosy about what you eat, including each individual ingredient and how it was grown. The roundup of root vegetables includes carrots, beets, and parsnips, with onion and bacon added for a major flavor power-up. This is one soup that will provide you with plenty of vitamins, including betalain, an antioxidant that you’ll generally only find in beets. This noodle soup has traditional style meatballs in it so you are going to have plenty of flavor in one bowl. The noodles are actually strings of spaghetti squash, so you don’t have to be concerned about wheat, gluten, or any other grain. She’s using grass-fed ground beef here, which is pretty much the only type of beef you should be eating on Paleo. Grass is what cows would eat in the wild, so it’s amazing that conventionally raised cows are fed copious amounts of corn and other unnatural substances. This soup has plenty of tastes and textures to keep your mouth interested and your stomach happy. You can have creamy soups on the Paleo diet, you just have to make sure that they don’t contain any dairy. Most cream based soups contain either milk or cream which doesn’t work while you are eating Paleo. In this recipe they have used coconut milk in order to provide the creaminess, and plenty of cooked chicken so that it will have the taste you’re expecting here. 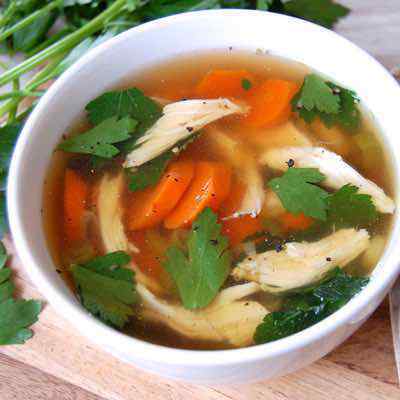 Add to that classic chicken soup vegetables like carrots and celery and you can see that this is going to taste just like you remember but without causing you any stomach problems later. Lemon and garlic might not get the spotlight too often when it comes to soup, but they’re on display here in this simple soup. They’re the two main ingredients, and since they both have equally strong flavors you’re sure to notice them even before you take a bite. 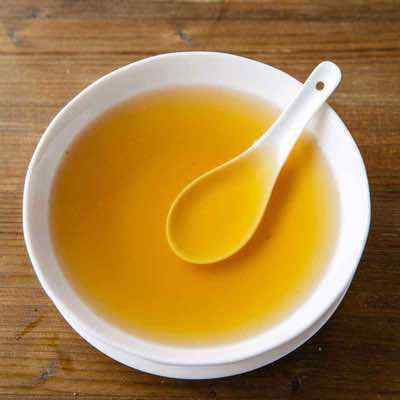 You can adjust the taste of this soup as you’d prefer, because the stock being used comes with option of using either a shellfish, mushroom, or chicken stock, depending on what you’re in the mood for and what you’ll be eating this soup with. You’ll love cooking with pumpkin more and more when you see how versatile it is and how well it plays with other foods. In this case it’s the spicy sausage chorizo, and the two combine in a wonderful way because of the smoothness and cooling nature of the pumpkin. When on Paleo you also need to keep your fiber levels in mind, making sure that you’re getting enough vegetables with dietary fiber to keep your digestion humming along and preventing the meat you’re eating from taking too long to pass through your system. Carrots often get used as a side item on Paleo, but here they’re given center stage. Known for their beta carotene, carrots also provide plenty of vitamins and some fiber, so they make a great choice as a veggie while on Paleo. 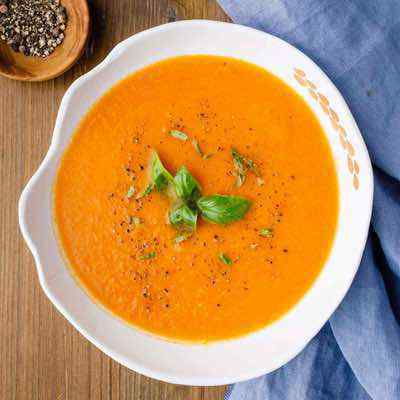 The best time to eat carrots is during the winter, and this soup will really serve you best on a cold winter’s day when spring looks like it will never arrive, but they can also be enjoyed year round. 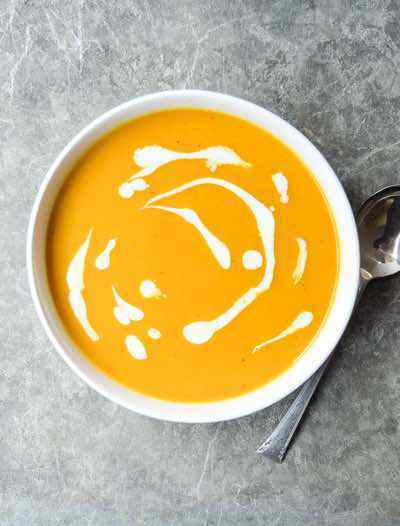 What makes this soup so special is that while the main ingredient is carrots, there’s also some apples, onion, orange juice, and coconut milk used in it, so the end result is nothing like eating a carrot-only soup. This is a Whole30 approved recipe, which means it’s also a Paleo friendly recipe. It has a base that consists of squash and coconut milk, so it will be silky smooth and creamy. For the orange flavor they are using a combination of orange juice and orange zest, so you won’t have to search for it. The ginger is ground, and will provide just the right amount of zest to offset the citrus taste from the orange. A bit of cayenne pepper makes this pop a little and keeps you guessing. Overall, an excellent start to a meal, or great as a side dish with a meat portion. 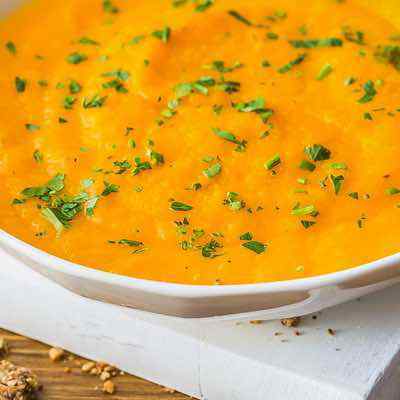 This sweet potato soup is going to catch the eye of anyone you serve it to, and the great part is that it doesn’t use any artificial coloring agents. That’s the natural color of purple sweet potatoes, which is a nice treat for the eyes and a break from the typical orange. Added to these sweet potatoes is ghee, an onion, and coconut milk for a nice creamy, smooth soup that you’ll love eating as much as looking at it. Don’t forget the eye appeal of your meals while cooking Paleo. It’s been proven that the better your meal looks the more satisfying it is when you eat it. 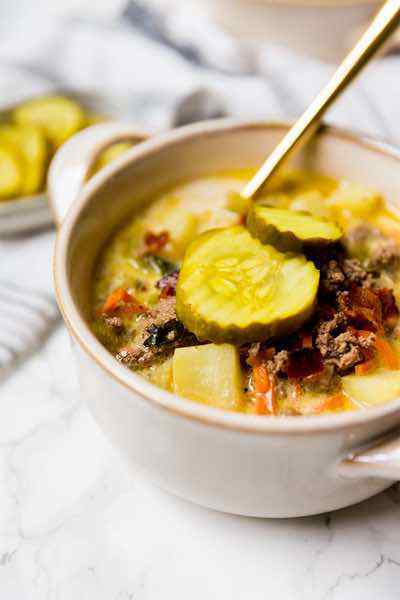 Everything about this soup screams Paleo, from the ability to eat sausage while on a “diet” to the nice balance of meat and vegetables for a complete meal. Many outside observers come to the false conclusion that Paleo is all about meat loading with wreckless abandon. In actuality it is about finding the balance of a hunter gatherer lifestyle that served our early ancestors so well. You can quickly see that the zucchini and spinach are just as much at the forefront of this meal as the spinach is. There is also tomato paste being used, so you’re getting more nutrients from that as well, including the famous lycopene that is so good for you. You’ve just got to love Crock Pot meals while on Paleo because they allow you to have caveman style cooking without having to babysit the stove. This chowder not only includes the yummy combination of chicken and bacon, it has an entire cutting board full of vegetables added to it. This means you’ll be getting plenty of added nutrients, minerals, and fiber along with your chicken and bacon. The thick nature of a chowder is great because it’s a meal that will stick with you and make you feel satisfied long after the meal has finished. 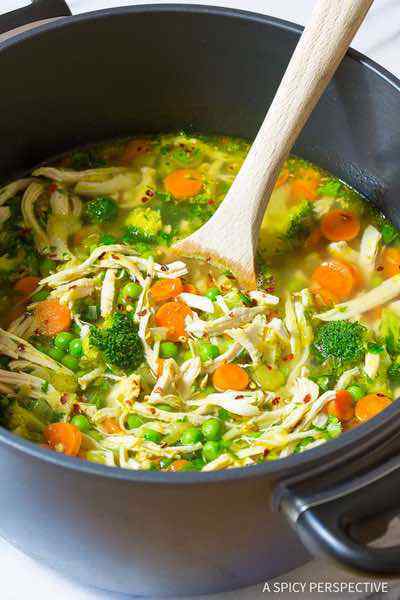 You simply can’t go wrong with this chicken soup, which breaks the mold of traditional chicken soups and adds many different flavors together to reach one goal: deliciousness. The coconut milk gives it a creaminess that you generally only find in soups with dairy in them. It also provides the coconut flavor that is advertised in the title. 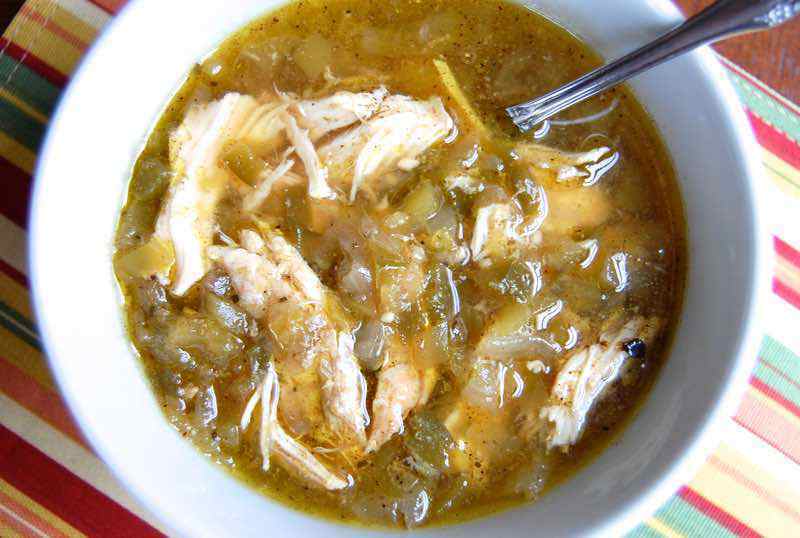 The green chiles are mild, so this won’t burn out your taste buds or make your eyes water, but will have a gentle flavor to it that sets it apart from other chicken soup recipes. Thai food is typically OK on the Paleo diet, consisting of plenty of vegetables, meat, and usually dairy free thanks to the use of coconut milk. 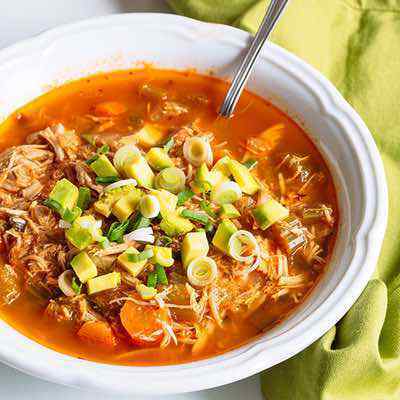 In this coconut turkey soup she’s using plenty of Paleo approved vegetables, with the turkey flavor coming from both turkey stock and shredded turkey. You can also use chicken with this, which comes in handy if you generally have chicken on hand more than you do turkey. The taste will be relatively the same no matter which meat you go with. You’ll want to leave out the soy sauce to make this strictly Paleo. This is a great mix of ingredients that taste best in the fall, when cider mills are at full capacity, squash is being harvested, and the leaves are changing in northern parts of the country. This is a way of blending it all together in one celebration of fall, a way of wrapping up a hot summer and preparing for a cold winter. 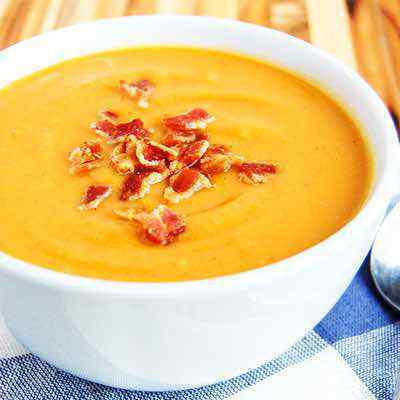 A big butternut squash forms the foundation for this soup, and applewood smoked bacon gives your taste buds a treat. A full pound of bay scallops is used in this chowder recipe, so you won’t be fishing around trying to find the meat the way you usually have to with most commercially made chowders. And unlike many seafood chowders you won’t find any potatoes in this. 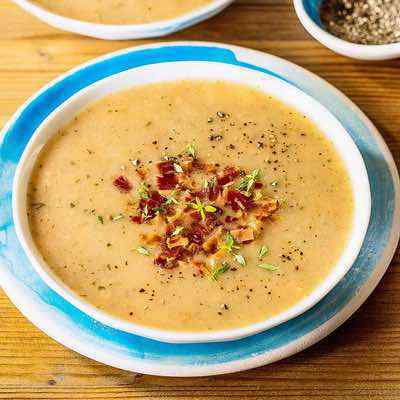 Instead you’ll be eating parsnips, mushrooms, and celery, and getting a nice serving of bacon as well to make it savory and chowdery. Seafood lovers will love this chowder, and will probably love eating Paleo since seafood is definitely on the menu. Oxtail is not something you’ll see on most restaurant menus, but that’s OK because when you eat Paleo you’ll be going against much of what mainstream America deems edible. This recipe does a great job of modifying French Onion soup so that it’s Paleo, while adding oxtail to the equation to make things interesting. The beef stock and onions insure that you’ll get the flavor of French Onion soup, and the oxtail provides protein that is absent from a traditional bowl of French Onion. This is a great soup to have, as it acts as a great way to get your digestion going before a meal, without causing you to lose your appetite. It’s a very light soup, made with just a handful of ingredients. Leeks and celeriac make up the veggies, and there’s no meat to be found. It’s a very simple soup, and isn’t meant to be eaten as a meal by itself, but can be a great accompaniment to a meal, especially during the winter when you’re naturally going to crave soups and warm meals. There’s plenty going on with this soup, including a trio of flavors that go together nicely. You get the curry taste that only comes from curry powder, along with the sweet and tart taste of apples, all on a backdrop of mild delight from the butternut squash. The squash also serves to smooth this out so you get a nice creaminess to it. Coconut milk helps the creamy cause, and also adds more flavor to this soup you’ll likely make more than once. If cream of celery soup is your favorite soup, this is going to be your new best friend. It makes a creamy celery soup without the use of any cream or other dairy. It even does it without using the coconut cream that is found in so many creamy Paleo soup recipes. So how does it pull off a creamy flavor and texture without using anything creamy? The answer is cashews, a vegetarian and vegan standby whenever they need some creaminess added to a recipe. Celery and onions is what you’ll taste most with this soup. Eating like a caveman doesn’t mean you can’t be refined and civilized. Go gourmet with this lobster bisque recipe that will have you feeling like you’re eating at a 5 star restaurant. The bonus is that you get to put as much lobster in it as you want, so you aren’t left at the mercy of the chef as to how much meaty goodness you get. In fact, the recipe is calling for a pound of lobster meat, so you know you won’t be scavenging through the bowl trying to find little slivers of lobster. 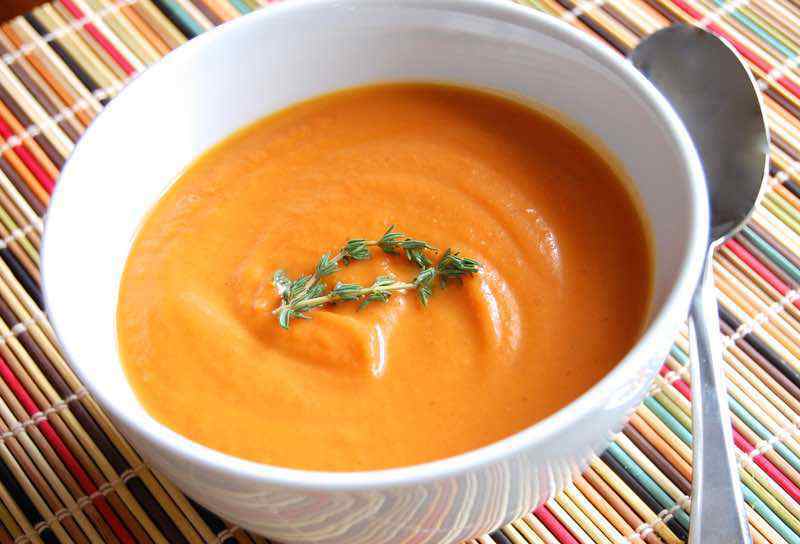 Enjoy big mouthfuls of it surrounded by a lovely bisque made from a host of healthy veggies. Tom yum is a popular Thai soup that can be made in a number of ways. It’s usually spicy and includes a various assortment of vegetables and seasonings, as well as your choice of meat. Here they’re using chicken, and have backed it up with mushrooms, baby corn, and tomatoes. They’ve also included lemongrass, which you’ll find used a lot in Thai cooking, and not so much in Western fare, so it has a bit of an exotic taste on the palate. The red chilies are up to you, so you get to dictate how much heat you want this to have. Here’s a soup to get you through the dog days of summer, as it is served chilled. It’s important to remember to chill your gazpacho and not let it reach room temperature, as it loses its appeal unless it’s nice and cool on the senses. 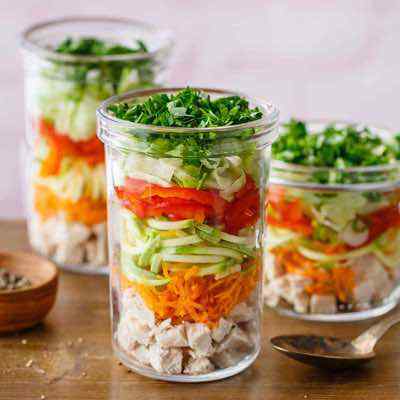 The ingredients are pulled right from the Paleo approved foods list, and include tomatoes, cucumbers, and onions, providing nutrients that are much needed on long summer days that can stretch to 15 hours of daylight or more. 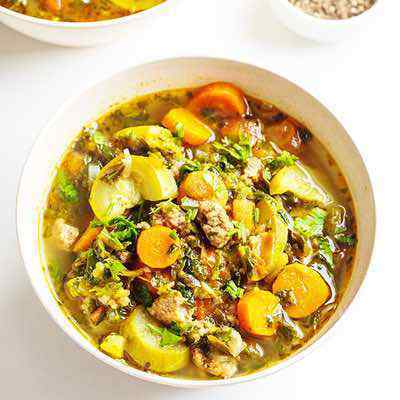 The body needs extra nourishment at this time, and this soup can help. Make a big batch and keep it in the fridge so it’s always at the ready. Sweet potatoes are great way to enjoy the taste of potato without eating regular potatoes which aren’t allowed on Paleo. They contain extra fiber and antioxidants so you are getting better nutrition because of the switch. 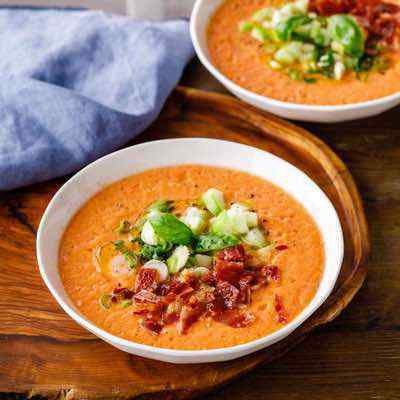 Here they have added bacon to the soup so it will have a rich savory taste to it, and they also include Indian spices so it will have that one-of-a-kind flavor that only comes from those type of spices. 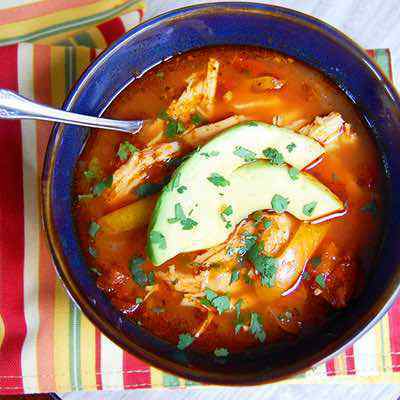 We’ll end this list with a classic soup that has been adjusted to fit the Paleo way of eating. This is a pretty traditional minestrone soup that doesn’t have any noodles because those contain wheat, which isn’t allowed on Paleo. In its place are even more vegetables and seasonings so that you won’t even miss the noodles. 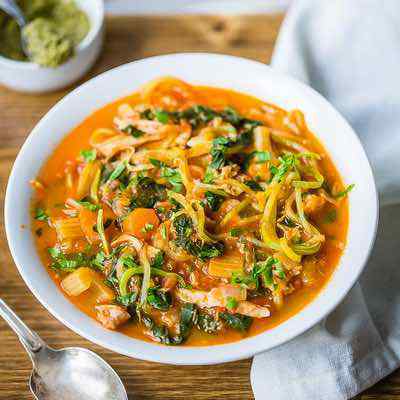 It might not look like the minestrone you’ve grown to know, but going Paleo means giving up a lot of your long-held beliefs about certain dishes. Previous articleMedical News Today: Is there a link between stroke and changes in gut bacteria?